Yesterday I finished the Feathers quilt for my niece, Kim. The pattern is by Alison Glass, and it is a fairly easy paper-pieced pattern, though I did modify a couple of the blocks that were giving me some trouble (see my September ‘18 OMG post for more information about this modification). 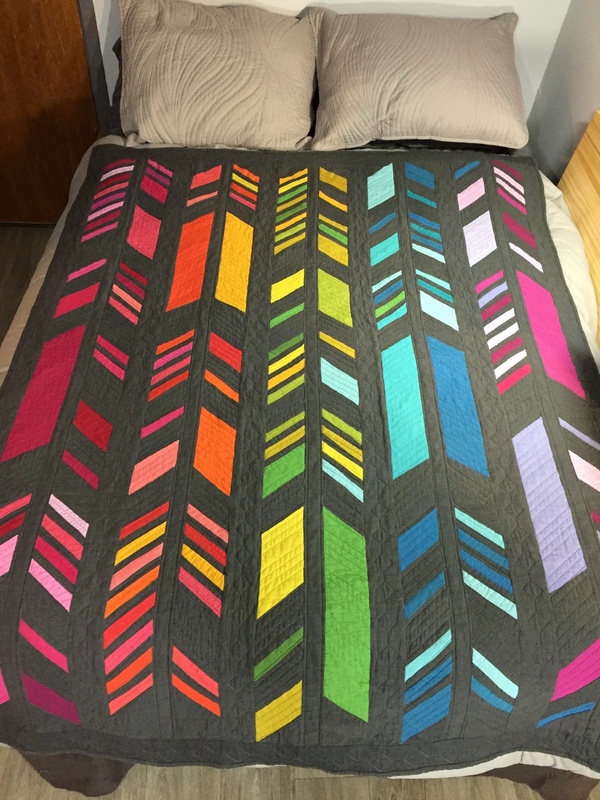 Below is a photo of the finished quilt on my bed, and considering it was taken inside, I think it does a decent job of showing the beautiful Alison Glass Kaleidoscope fabric colors thanks to strategic placing of a couple Ott lights. Here is a pic of the quilt top taken in my friend’s sun room with a lot of natural light, and the colors don’t look all that different. ThreadBear did the custom quilting on this quilt. I had the idea of parallel grey quilting lines on the feathers, and colorful diamonds in a coordinating color on the wide sashing strips. Then we agreed that the narrow sashing strips would have two lines of quilting also coordinating with the colors of the adjacent feathers. None of the photos I took do a good job of highlighting the quilting, but the pic below best shows some of the different colors of thread in the quilting. Yesterday I wrote a Quilt Label Tutorial post and was happy with how the label turned out for this quilt. 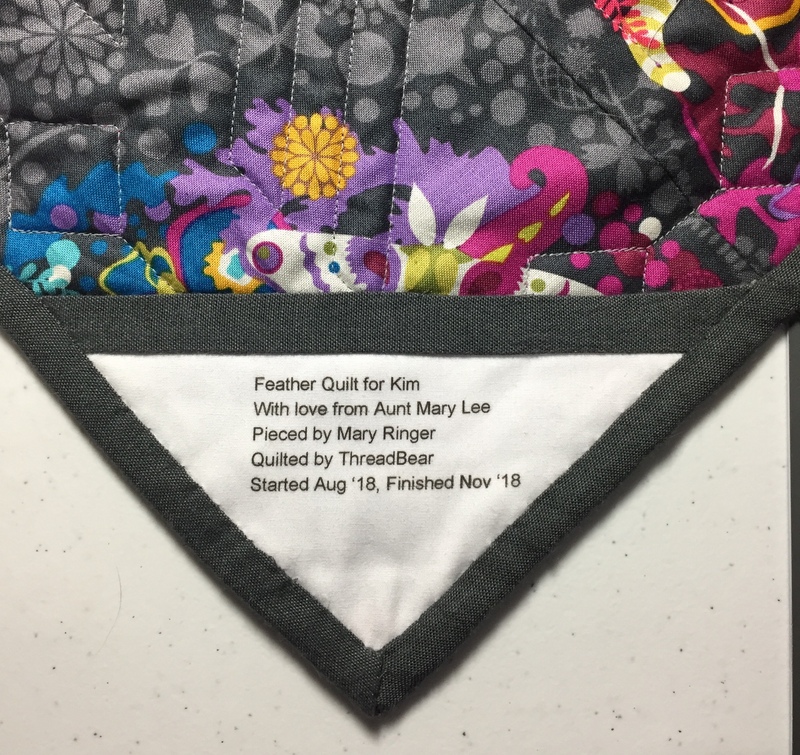 However, last evening something made me look at the label on this quilt, and I have to say I was momentarily horrified that I had typed “Feather” rather than “Feathers” on the quilt label. But then I decided that it just isn’t that big of a deal. 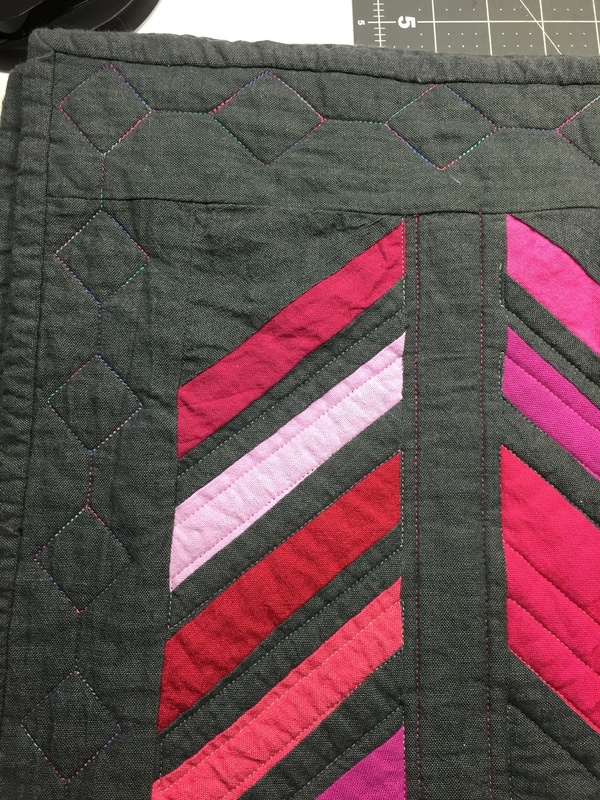 I will explain to my niece that if she wants to read posts about her quilt that she should look for Feathers Quilt posts. This was one of my 2018 Qtr 4 Finish-A-Long Goals. 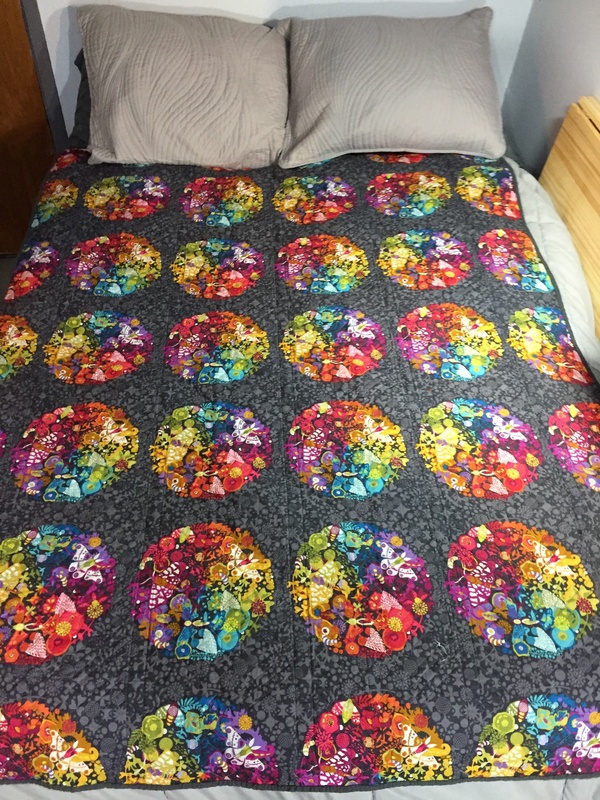 Linking up to Cooking Up Quilts: Main Crush Monday. Also linking up to 2018 Qtr 4 FAL Link-Up. 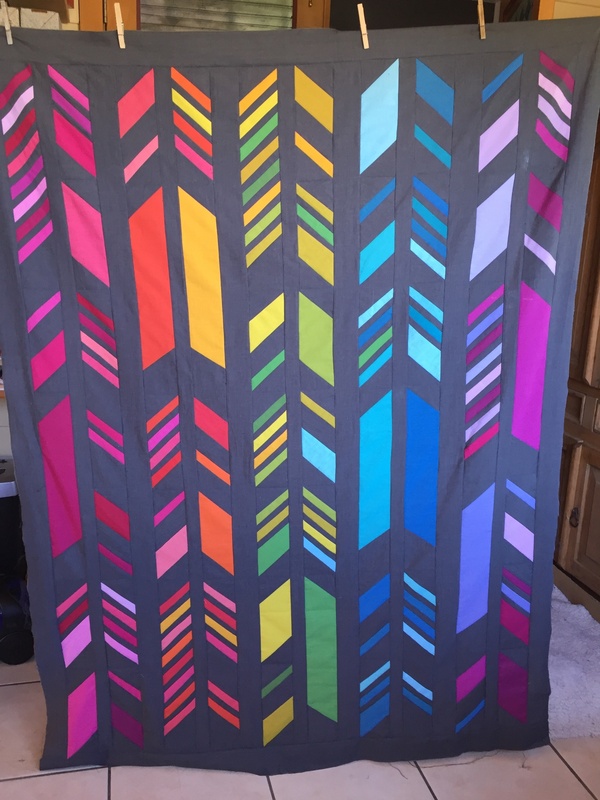 This entry was posted in 2018 Quilts and tagged Feathers Quilt. Bookmark the permalink. 6 Responses to Feathers Quilt Finished! What a beautiful quilt, Mary. The quilting is a lovely compliment and the backing fabric is perfect. I am sure that your niece is going to be thrilled to receive it!! OOh your Feathers quilt is gorgeous. Lucky Kim to be recieving such a beauty! Congratulations on an absolutely beautiful finish! And thank you for playing along with us during the 2018 FAL!